Whenever I get engaged in a debate where I argue that mixed economies, although very promising in theory, get too mixed up too work, I invariably face a statement similar to this: "But look at the Scandinavian countries, especially Sweden. Mixed economy and welfare state is working so well there and in fact doing better than the free market economies." Well, Sweden seems to be the ultimate example of the promise of welfare state. But is it really? When a well-functioning and sustainable welfare state seems to elude every nation around the world, Sweden seems to have turned into reality all the rosy promises offered by socialists. What's the secret of the successful socialist Sweden? Sweden did not become wealthy through social democracy, big government and a large welfare state. It developed economically by adopting free-market policies in the late 19th century and early 20th century. It also benefited from positive cultural norms, including a strong work ethic and high levels of trust. As late as 1950, Swedish tax revenues were still only around 21 per cent of GDP. The policy shift towards a big state and higher taxes occurred mainly during the next thirty years, as taxes increased by almost one per cent of GDP annually. The rapid growth of the state in the late 1960s and 1970s led to a large decline in Sweden’s relative economic performance. In 1975, Sweden was the 4th richest industrialized country in terms of GDP per head. By 1993, it had fallen to 14th. Big government had a devastating impact on entrepreneurship. After 1970, the establishment of new firms dropped significantly. Among the 100 firms with the highest revenues in Sweden in 2004, only two were entrepreneurial Swedish firms founded after 1970, compared with 21 founded before 1913. Since the economic crisis of the early 1990s, Swedish governments have rolled back the state and introduced market reforms in sectors such as education, health and pensions. 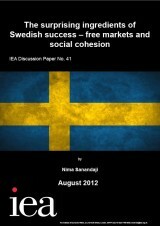 Economic freedom has increased in Sweden while it has declined in the UK and USA. Sweden’s relative economic performance has improved accordingly. Sweden was a poor nation before the 1870s. As a capitalist system evolved out of the agrarian society, the country grew richer. Property rights, free markets and the rule of law, in combination with large numbers of well-educated engineers and entrepreneurs, created an environment in which Sweden enjoyed an unprecedented period of sustained and rapid economic development. In the hundred years following the market liberalization of the late 19th century and the onset of industrialization, Sweden experienced phenomenal economic development (Maddison, 1982). The complete discussion paper can be downloaded here. So what do you think? Feel free to share you views and opinions in the comments below.